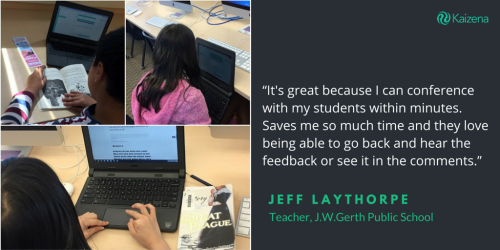 We love hearing about the new and creative ways that teachers find to use Kaizena. The latest one comes from Jeff, a 4th grade and special education teacher from our hometown, Kitchener-Waterloo! First, the class is split into 4 groups. Groups 1 & 2: Quiet reading time. Group 3: Uses Google Docs to create a summary of the material read. This doc is then shared with Jeff through Kaizena for feedback. This is a quick way for him to view students’ reading comprehension and see if they are understanding the underlying themes, theories and concepts. Group 4: Uses the voice comments feature on Kaizena to record a clip of themselves reading aloud. By hearing how they sound, students can focus on their reading fluency - their speed, expression, and overall smoothness. Plus, this keeps a virtual record of their progress throughout the term! Let us know how you use Kaizena in your classroom by tweeting us @KaizenaHQ! Tony, a Science & English teacher explained to us that in his online classroom setting, he often has the luxury of working one on one with students when providing feedback. Because of this, he uses Kaizena in a slightly different way than most teachers.